The attribution of human form or behavior to a deity, animal, etc. Note: Scroll to the bottom for pictures as it grows. Sometimes in the middle of one of these Muscovey Chronicles I catch myself thinking about things. There are things that I have seen humans do that seem so similar to these ducks. You can get all scientific and call it anthropomorphism if you want. I admit it. For instance, if you have never seen a mama go to bat for one of her youngsters I recommend going to: http://www.grangerlandrfd.com/dont-mess-with-mama-duck My mom would have acted like that. This one has nothing to do with courage (well, maybe) but it does have to do with determination. If you are thinking that determination while under fire does have to do with courage I won't argue. This mama laid about six eggs in a nesting box in a fairly public area. I didn’t care to expose them to every raccoon or possum in the area so I moved her into this planter on the floor of a raccoon proof space. Then I filled the tub with pine chips. An open water container and food on the floor of the space was enough to keep a setting mama happy. Time passed. A muscovey takes 35 days to hatch and we were coming close when one day she greeted me with a strange confused look. Her eggs were gone and her space was a mess. 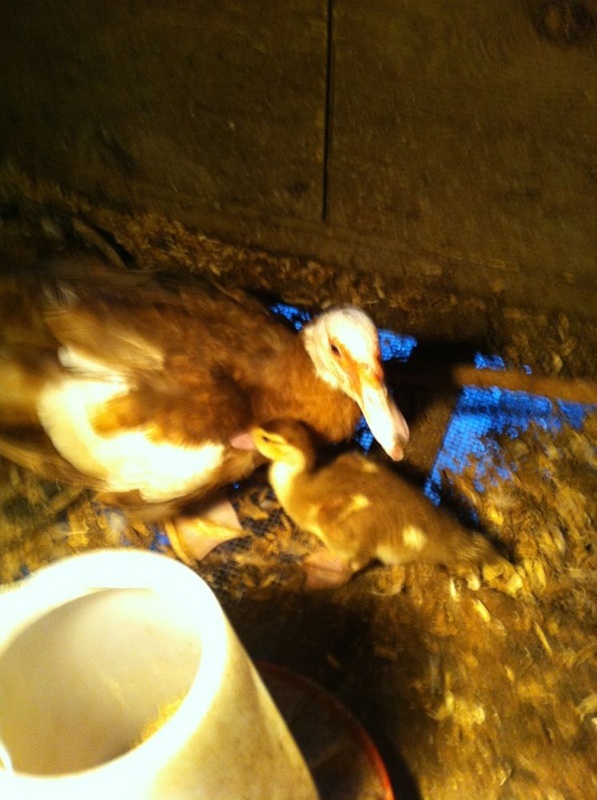 I’ve seen grief in a duck before and it has generally been when a mama is grieving for a lost baby. Mr. Goose went through stages of grief when Mrs. Goose became a redneck casualty and I’ve seen other strange things like the way the donkeys act around blue's grave. This wasn't strange, however, it was human. There was no doubt, that this was an initial stage of grief, probably the denial stage. She was walking around the tub looking for them and I expect they were victims of a snake as nothing else could get in the pen. Later I found a snake wrapped around a young chicken in a nursery cage. I didn’t recognize the type so he got away after a beating and I set about upgrading the cage. I will see him again. Snakes are not so frequently seen as you might think and they can find access where none exists. I put three eggs in her nest and she readily accepted them. Since I didn’t care to feed a snake I gave her a half hour to forget and then picked her up against her wishes and put her in a more secure cage. Then I prepared a nesting box from a milk carton, put the three eggs in it, and put it in the cage with her. She started setting again. For the past several months she has been the most successful setter on the place. I try to watch out for her. She got in the habit of almost greeting me when I would approach and came dangerously close to being friendly. Now she was sitting on the last three of nine eggs. Just last week we noticed her off the eggs and took a look. Only one egg. I went through a bit of a personal crisis because a snake had outsmarted me and dined on about 8 developing eggs to this point. Then I got busy and looked for the access to the cage that had not been discovered by me or the previous snakes. Sure enough there was a small slit in the hardware cloth covering the cage. I have no clue how long it had been there. I do know that it was new to both the snake and I.
I have used this cage for this purpose for 3-4 years and only once has a snake gained entry. I fixed the hole and noticed she was back sitting again on the last remaining egg. Her world might be falling apart but she was going to do her job. Today when we were returning from town Sally discovered the baby in the top photo. Now mama is aggressive and I sure don’t blame her. No friendliness to be seen. Since there is only one baby she gets stuck with it till I think it’s large enough to function outside. When there are several we separate them from Mama after a couple weeks. Probably we will put it in the goat pen when it’s too big to make it through the holes. I’m sure that means she will be there too. The milk carton is the setting box she used for 35 days. We pulled it out today and replaced it with a lid from a 55 gallon drum. The sides are short enough that the baby can get in and out right now. Like always we cleaned the feeder and the waterer. For baby duty they are cleaned with bleach, rinsed, and allowed to dry. That container with the red top is actually the feeder, upside down and drying. This is the drum lid that I set out for them. There are clean pine chips (that they will probably ignore) and the small pile on the near side is fresh chick starter. I put that out while waiting for the feeder to dry. 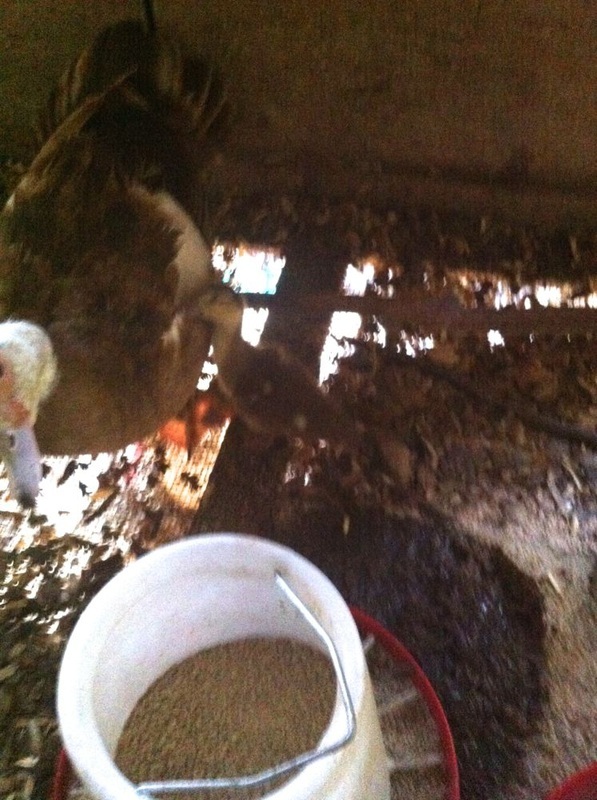 The duckling can survive for two days off the yolk without food or water but I give them food immediately. If it gets cooler (a myth in Texas) or wetter they will be more comfortable. Mama and baby will have to live here probably at least three weeks or until baby outgrows the holes in the goat pen. 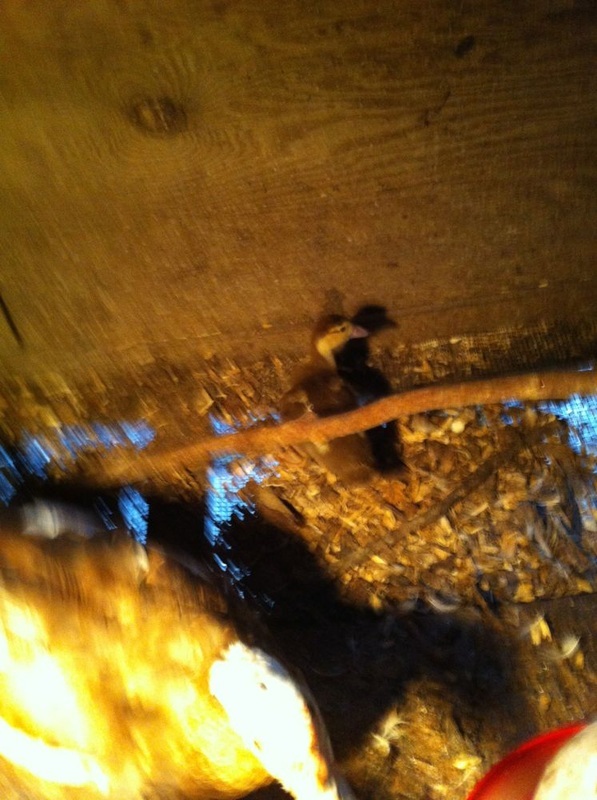 Of the four ducks we put in that pen last month, two remain. It might not be a coincidence that they are a matched pair. The two that escaped are female and are probably practicing evasion tactics till they are large enough to mate. They have teamed with the mama duck from “don’t mess with mama duck”. Well go ahead and be aggressive Mama. I wish you luck and you deserve it. The baby is a l ittle difficult to see. That is it climbing up the side of Mama. We intend to keep taking pictures as this little critter grows. Since it will be with mama I think this should be a better chronicle of growth. If there are interesting developments or just a chance to get better pictures I will try to make it happen and repost on fb. This mama duck can get mean. In all fairness I've removed her from the cage when she has had flocks in the past. I have no intention of doing that this time because there is only one duckling. I guess the growth is a little tough to see just now but that won't last for long. If you note in the first picture he looks round and subsequent ones he seems a little longer. When he/she grows a bit I will put a tub of water in the cage and fill it with a hose every day. We will see what comes. 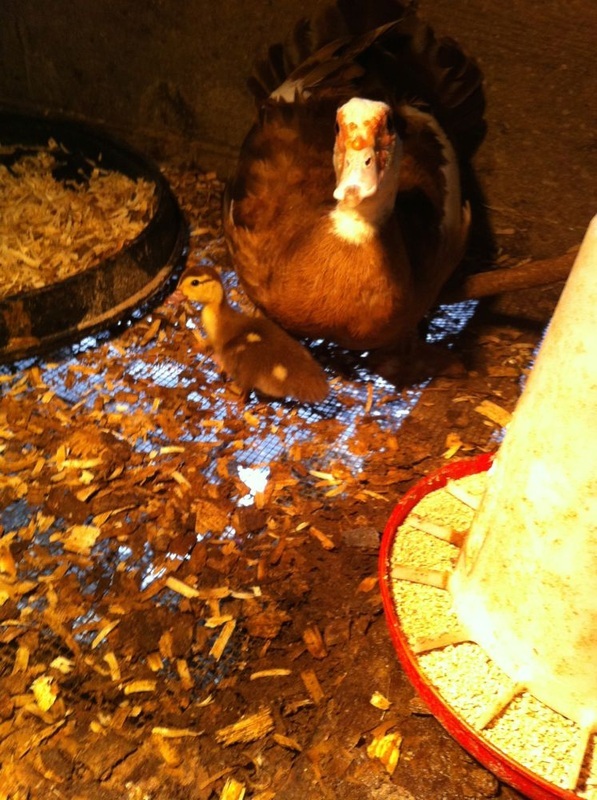 Changing to the adult duck waterer at a little over 2 weeks. Big enough to get in and out without problem. Taken unawares. Posing is better but too distant. Hiding behind Mommy. Nothing but two eyes and a bill.